Prosciutto, an uncooked Italian ham, is made by air drying salted ham, coating it with salted lard and curing it again -- usually for one to two years. The length of curing time and amount of salt used varies by brand and region in which the ham is made. Prosciutto is a nutritious food and commonly finds use an accompaniment to fruit and melons, as well as in sandwiches and recipes. A 2-ounce serving of prosciutto contains 120 to 160 calories, according to MyFitnessPal. It also has 6 to 12 grams of fat -- the fat varies based on the amount of lard used to create this specialty ham, as well as the amount of fat naturally present. 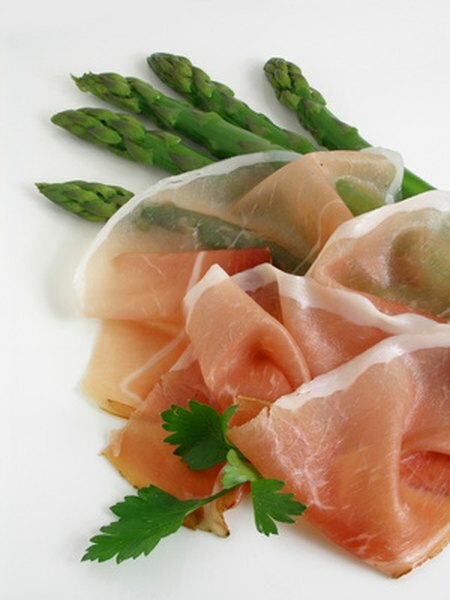 Prosciutto is quite fatty -- 45 to 68 percent of the calories come from fat. Look over your daily meal plan at the fat in the other foods you will consume; no more than 20 to 35 percent of your total calories for the day should come from fat. Your body needs fat to function correctly, but too much dietary fat can contribute toward excess weight gain. A typical serving of prosciutto contains no carbohydrates, although some prosciutto treated with a crust of cracked peppercorns and other herbs or spices may carry a small amount. A 2-ounce serving of prosciutto does contain protein, though -- 14 to 16 grams. To best meet your nutritional goals and energy needs, the Institute of Medicine recommends consuming 46 to 56 grams of protein each day. Prosciutto is a good choice for protein -- it is a complete protein, or one that provides you all nine essential amino acids. Protein helps your body make and repair cells and aids in the structure of all your muscles and organs. Including prosciutto in your meal plan can give you a boost in your iron intake. A 2-ounce serving provides 4 percent of the recommended daily intake of this mineral. Iron plays a role in many enzymes in your body, which help you digest food and aid in bodily function in a variety of ways. It also helps carry oxygen -- iron helps make up your red blood cells that carry out the mission of oxygenating every part of your body. Because prosciutto is salted as part of the process of creation, it contains high levels of sodium. If you monitor your salt intake or have salt sensitivities, you may want to replace it with less salty varieties of ham. A 2-ounce portion of prosciutto has 1,280 to 1,540 milligrams of sodium -- the American Heart Association suggests keeping sodium intake to 1,500 milligrams or less. Too much salt in your diet can elevate your blood pressure.